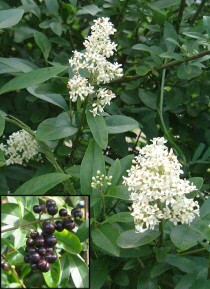 PRIVET, WILD (Ligustrum vulgare). Hedging Plants, Trees, Shrubs and Conifers. Warning: Some parts of this plant are poisonous. Flowers in July in native hedge. Inset: black fruits in autumn and winter. Semi-evergreen fast growing dense hedge with medium sized leaves and clusters of creamy-white flowers in July, attractive to insects. Shade tolerant. An asset to wildlife with the flowers in July and long bunches of shining black fruits in winter, attractive to birds. In cold winters it will lose its leaves. SHRUB 10ft x 5ft (3m x 1.5m).